Whenever I’m working with a client who has mobility issues, tension or pain, I’m aware that there are really three elements that contribute to that condition. The first is structural, and that’s primarily where I do a lot of my work. Whether I’m facilitating release using the tools of sensory awareness to regulate the nervous system or doing hands on manipulation, I’m dealing with the balance of tension in the muscles and tissue that affect bony alignment and mobility. You could also call this “posture,” but I think that’s a fairly limiting term. Posture is part of it. It’s not all of it. Anyway, that’s the first element. The second is lifestyle. What are you doing on a day to day basis? How much stress do you carry? Are you sleeping? Eating? Are you sitting in front of a computer for eleventy million hours a day? What about workouts? Lifting weights, training for a half marathon, or halfheartedly doing ten minutes of yoga every twelve days or so? Those two elements — structure and lifestyle — create an interrelated loop of form relating to function. Your form (i.e. structure, or posture if you prefer) determines how your body functions, or moves. And then how you move your body also shapes your form. So, they play off of each other. This interface is generally my zone — looking at forms and functions and determining how to optimize both for each individual person. It sounds highly technical and kind of engineer-y, I know. There’s actually a lot of art and nuance in it. Anyhow, I digress. On to that third element I talked about. The third piece of mobility is body chemistry: what’s going on at the cellular level. This topic is H-U-G-E. You could, and people do, devote your life to it. Usually, they’re called doctors, and when you go to see them, they take blood. Then they send your blood to a lab to analyze a million (okay, twenty-ish) different compounds. Right. Because, like I said, this is a huge topic. You can measure hormone levels, cholesterol, vitamins, various proteins, minerals. And probably a lot more things I’ve never even thought of. But it’s those minerals I want to talk to you about. Because if you woke up stiff and achy every morning, if your neck had a permanent crick in it, if it wouldn’t release its grip on your skull no matter how many deep tissue massages you had, but there were a simple, natural, relatively safe supplement you could take that might make it all go away in the blink of an eye, I’m guessing you’d want to know about it. And now I sound like the worst cheesy marketer ever. Yuck. Which is why I don’t really write about supplements much anymore. There are roughly ten trillion of them out there and each and every one of them promises to cure your gout, clear up your acne AND keep the IRS at bay. Anyhow, supplements can be great. The right one can change your life. Figuring out which nutrient is doing what and what vitamins, herbs, minerals, tinctures and compounds you actually need is a lot harder than it sounds, though. I mean, even the form of a nutrient can impact whether your body can use it or not, and I’m not just talking about general absorption here. Your specific genetic make up can determine which forms of nutrients your body can assimilate. Your body. Not human bodies. So, I guess what I’m saying here is that I caution you about jumping on any old supplement band wagon in the name of longevity, or whatever. Do your due diligence. And with that clearly stated, I now feel comfortable telling you about this — to me — magical mineral. It’s affordable, it’s relatively safe (always a good idea to check with your doctor, though, because peanuts are relatively safe but they can still kill some people, so make no assumptions) and if you’re deficient in it, you’re likely going to experience pain, tension, muscle cramps and possibly headaches. What is this sorcery, you ask? Magnesium. It’s a simple mineral found in basic foods like avocados, black beans, spinach, whole grains and dark chocolate (yum). And it’s involved in over 300 chemical reactions in the body. So, it gets used up fast when it’s around. One of the (very important) functions of magnesium is to help your muscles release a contraction. You go to the gym and lift of the weights, and then when you put them down, your muscle tissue requires some free magnesium to relax the tension built up during the lifting. Or, you know, when you pick up your toddler. And the groceries. And diaper bag. And that Christmas package you still haven’t shipped to your father even though it’s now most of the way through January. Anyway, you get the point: squeeze muscle, insert magnesium, release tension. 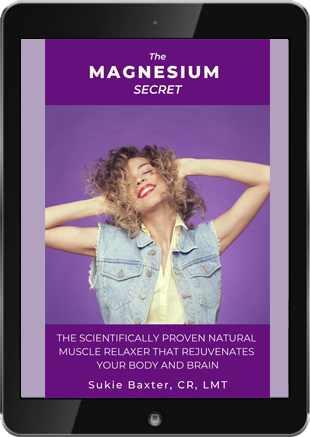 So, if you’re deficient in magnesium, and a lot of people are (more on that in just a sec), you’re not going to be able to let go of all that built up tension. It’ll stick around, no matter what you do. No matter how many massages you get, or how many stretches you do. Too little magnesium and your muscles will get the signal to chill out from your nervous system but they’ll be unable to comply. Taking magnesium doesn’t fix everything about muscle tension. It won’t make all your pain magically disappear (although, true confessions, I slacked off taking it and when my doctor reminded me I should be, the unusually severe back spasms I’d been having — and mostly ignoring because, life — vanished within two days). Magnesium doesn’t fix the other two elements of tension: structure and lifestyle. And it might not balance all your body chemistry. You don’t have to buy a new mattress or stretch fourteen hours a day or get a massage six days a week (although, wouldn’t that be nice?). And that brings me to the question people always ask: can’t I just get my magnesium from food? Here’s why: most people don’t eat a lot of magnesium rich foods, like leafy greens, whole grains, beans and nuts. But even if you did eat a diet super high in magnesium, you might still not get enough. Well, if you’re deficient to begin with, it’s hard to build up stores with just dietary sources. You need what’s called a therapeutic dose. Sometimes this can be quite high. I know that for certain conditions, doctors can even administer large quantities of magnesium intravenously. So, a cup of spinach probably isn’t going to cover it if you’re that deficient. Also, modern day foods tend to be lower in magnesium for a couple of reasons. One is over farming of soils that results in mineral depletion. The other is that increasingly crops are being selected for high yield (farmers want to maximize profits, understandably). That doesn’t mean that you shouldn’t eat your veggies, of course. They’re still good for you. But it does mean that you might need to give your diet a little help, especially if you’ve been on the processed food train in the past. And when it comes to magnesium, since it’s such a prevalent and highly utilized mineral, it’s worth taking a look to see if it might benefit you. While you can just buy a bottle of the stuff over the counter and start chugging, the more scientific (and safer) way to supplement is to run some blood work to analyze your levels. That way you know what your starting baseline is and can measure the effectiveness of your supplement. If you don’t test, it’s harder to track. Not impossible, just harder. Your experience is a lot more subjective. One final note: I know I already mentioned, like, forty times talking to your doctor about supplements. Magnesium is sold over the counter and anyone can buy a bottle, so you certainly don’t have to get medical counsel before taking it. But if you choose to forego the blood work (understandable), at least take a look at the contraindications and make sure there are no red flags before diving into a vat of this magical mineral. *Disclosure: This is an affiliate link, meaning, at no additional cost to you, I will earn a commission if you click through and make a purchase.